Let’s face it, wherever you may go, there will always be that one person who does something annoying. Talking loudly over the phone, passing unwanted comments or even bad hygiene, these types of people are found everywhere. At public places, meetings, cinema and yes even at the gym. A gym is a place for everyone to work out and maintain their body. Nowadays for many people gym is the place for hanging out and clicking pictures rather than working out. Not only that, there are a lot of other infuriating habits of these individuals who mess the etiquette of the gym. Let’s go over some of these annoying habits below. Now this is something that can be really annoying. Don’t you just get mad when someone is using a particular machine for more than 30 minutes? Either the person does not care or he is just a big show off. As it is there are a limited number of machines, so using one for a long amount of time is not advisable. Even a courteous thing to do will be to ask the person if he or she is willing to rotate after three or four laps. Do not just cling on to a machine for the sake of it. Yes you might get some important call from your home or office but keep the call short and simple. No one at the gym is interested to hear about your meal in the night or your complaints about your boss. To top it all, when one starts speaking loudly over the phone and don’t even care about the ambience of the gym. It is pretty simple, when one receives an important call or a call from their dear ones, they need to take few minutes out, step outside the gym premises, and talk their heart out. It is very annoying when people take out their phones without any kind of regard for the people around. There is always someone standing in front of the mirror and clicking pictures, which they later upload on their social media profile along with a motivational gym quote like “NO PAIN NO GAIN”. There is a certain time and place to click pictures of yourself and rest assured, a gym is not that place. Especially younger people coming to a gym are more interested in clicking pictures to post on Instagram and Snapchat rather focusing on the workout. This is also very distracting when you are trying to work out and someone besides you is posing and pouting. You should have respect for the environment, the workout and more importantly the people around you. Another big annoying habit is clicking pictures in the locker room. It is good to flaunt your rock hard Pecs, but you need to know when to stop. Imagine using the butterfly machine, and as soon as you sit you are greeted with the sweat of someone else? Gross, isn’t it? This also tells a lot about their personal hygiene. They even give excuses of ‘forgetting’ to wipe off the sweat. Carry a towel with and wipe down the seat after you have finished using a machine. It does not matter whether you sweat a little or like Niagara Falls. 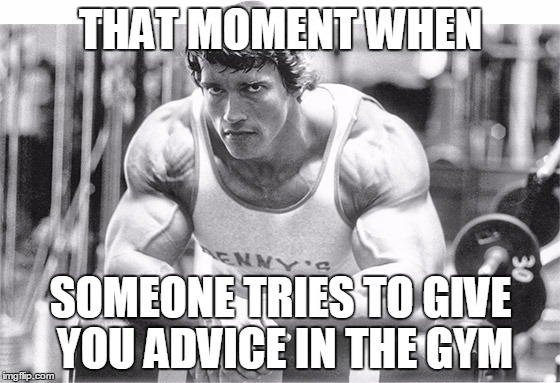 It is tough not to listen to an advice while you are at the gym. They don’t seem to get that once you are done with your gym regime, pack your bags and leave the gym already. The trainers are there to take care of their people. Until and unless the person asks you something, do not offer your expert opinion. It is actually annoying when you are lifting or pressing and someone comes and tells you to add more weights or start boasting about their inhumane strength. Discipline is something that has to be inculcated in a person’s life at a very early stage. Gym is a place where you are accountable for your actions. If you have used a 20 kg dumbbell, place it back in its spot, not some other place. There are few rules, and people need to abide by it. Also, do not litter the whole gym with your gear. Put it in the locker where it will be safe. These are just a few of the many annoying practices you might come across while working out in a gym. It’s not rocket science to put equipments in proper places or following the basic protocols of the gym. After all, it is a public place and used by many.